HONG KONG, Feb 1, 2018 - (ACN Newswire) - Chance favours only the prepared mind! 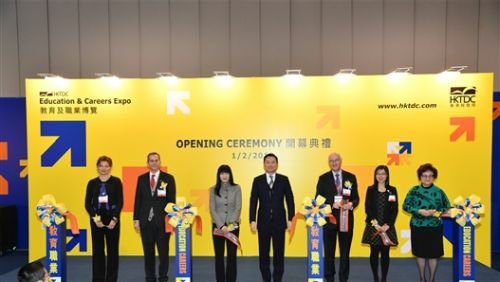 The 28th HKTDC Education & Careers Expo kicked off today and continues through 4 February at the Hong Kong Convention and Exhibition Centre (HKCEC). Open to the public free of charge, the expo is organised by the Hong Kong Trade Development Council (HKTDC) to provide a wealth of information on education and job opportunities for students and visitors at different stages of life and career paths to better equip themselves. The Honourable Caspar Tsui, Under Secretary for Labour and Welfare of the Hong Kong Special Administrative Region (HKSAR) Government, officiated at this morning's opening ceremony. "Entering its 28th edition, the Expo has become a signature event in Hong Kong," said Margaret Fong, Executive Director, HKTDC, in her opening speech. "It is a valuable platform for students and job seekers to connect with a wide range of institutions and employers, and to get the best advice on education and employment opportunities." This year's Expo welcomes 870 educational institutions, professional associations, government departments, public organisations and private enterprises from 22 countries and regions. The expo features the Education Zone and Careers Zone. The Education Zone gathers various local universities, higher education institutions and professional organisations, including the Vocational Training Council (VTC), Hong Kong Shue Yan University, Hang Seng Management College, Chu Hai College of Higher Education, Construction Industry Council and YMCA, where students, parents and individuals can find a wealth of information about their programmes. Studying abroad is an enriching experience for young people. The expo's education theme days focus on several popular destinations for studying abroad, including the Chinese mainland (1 February), the United States (2 February), Europe (3 February), as well as Australia and New Zealand (4 February). Education service consultants will be on-site to advise on the admission procedures, entry requirements and campus life in these destinations. Visitors can also find abundant information and consultancy services on studying and working abroad at the "International Exchange Village", representing Consulate General (CG) offices and officially recognised bodies from Japan, Korea, the Netherlands, Mexico, South Africa, Sweden, and Belt and Road countries including the Czech Republic and Hungary. (New) Arts & Culture (1 February): Supported by the Vocational Training Council (VTC) and first-time exhibitor West Kowloon Cultural District Authority, and the Leisure and Cultural Services Department, a range of seminars on job nature and requirements for careers related to culture, arts and museums are featured. The West Kowloon Cultural District Authority is introducing a six-month M+ internship programme for those looking to enter the museum industry. Recruiting on-site during the expo, the Leisure and Cultural Services Department is seeking leisure services and musical officers. VTC graduates are also presenting industry-collaboration projects that incorporate technology and STEM elements. Electrical & Mechanical (2 February): The Electrical and Mechanical Exhibition Zone under the Hong Kong Electrical and Mechanical Trade Promotion Working Group, comprising 19 institutions including the Electrical and Mechanical Services Department, CLP, MTR and the Water Supplies Department, offers information on the latest developments of the industry, as well as training and job opportunities. (New) Banking & Finance (3 February): Co-organised by the HKTDC and the Hong Kong Institute of Bankers, financial institutions such as Hang Seng Bank, Nanyang Commercial Bank Ltd, and the Hong Kong Institute of Bankers will cover the job nature and explore opportunities from Financial Technology also known as Fintech and how to obtain qualifications to become a certified banker during the theme day. (New) Civil & Public Services (4 February): Representatives from government departments, the disciplined services, such as the Hong Kong Fire Services Department, the Police Force, the Immigration Department, the Correctional Services Department, the Customs and Excise Department, along with public bodies Airport Authority and HKTDC, will introduce various posts and recruitment details. The Youth Zone returns this year with information on further education and career planning for young people. Representatives from the Labour Department will introduce the Youth Employment and Training Programme, which is designed to support local youth employment, and provide information on various overseas employment and working holiday programmes. The expo also offers on-site job recruitment by various government departments and public and private organisations, including the Police Force, Fire Services Department, Immigration Department, the Airport Authority, West Kowloon Cultural District Authority, Centaline Property Agency Ltd and DKSH. Nearly 2,400 job vacancies, comprising full-time jobs, summer jobs and internships, are on offer during the expo. More than 100 on-site activities will be held during the expo this year, including police dog unit and fire investigation dog performances, seminars on DSE and IELTS examination tips, as well as talks on further studies, career prospects and working holiday. On 3 February, veteran educator Hui Shing-yan will share tips on studying liberal studies and preparing for the DSE examinations. Elton Chau, General Manager, NTK Academic Group, will talk about the International Baccalaureate Diploma Course (IB) programme on 4 February. Other events include a seminar featuring Teddy Head, who will offer tips on becoming a professional YouTuber (2 February). Travel show personality Chris Leung, who obtained eight As in the HKCEE and was chosen to be among the three finalists for "the Best Job in the World Campaign" in Australia, will share how to turn one's passion into a career in the seminar "What's your dream life?" (4 February). Reo Lam, Business Director, CTgoodjobs will share how to make use of body language to excel in workplace (4 February). On 3 February, a range of working holiday seminars will also be staged, detailing job types and eligibility of working holiday programmes in Austria, France, Germany, Japan and Sweden.